The area’s cultural and religious heritage offers excellent sites of historic and archaeological interest, including an interpretive reconstruction of an Iron Age roundhouse, 2,000 year old broch and hut circles. Applecross boasts geology to rival that of the Grand Canyon and a wealth of plant and wildlife, regular sightings of otters, sea and golden eagles. Further afield are the Torridon mountains and the beautiful islands of Skye and Raasay, as well as whale and dolphin watching. The list is endless. Award winning establishment, The Applecross Inn offers a fantastic atmosphere and excellent seafood. The Applecross Outside Inn offers takeaway fish & chips on the waterfront, along with Applecross Ices (homemade ice cream) and good coffee. The Potting Shed Restaurant is located within the glorious Walled Garden, part of the Applecross Estate grounds. It provides excellent food amongst the flowers, the best breakfasts, delicious cakes and locally caught seafood! 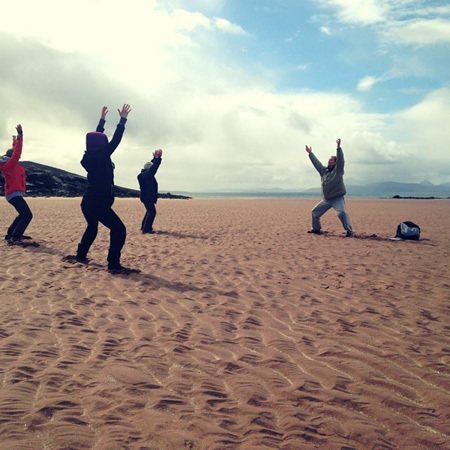 For the explorers, the extremely active, the thrill seekers, Applecross is simply an adventurer's playground. Sea kayaking, climbing, trekking, mountain biking and cycling are all on the doorstep. As is a spot of wild swimming with the resident seals, a run through the leafy trails of the estate grounds, coasteering, gorge walking, wild camping... we could go on forever. Take a look at the Walk Highlands website for a good selection of walks in the Applecross and Torridon area.